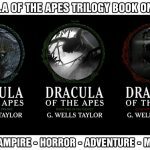 Dracula of the Apes Trilogy NOW AVAILABLE! Dracula of the Apes Trilogy Now Available! Book One: The Urn FREE at Smashwords, iBooks, Kobo, Barnes & Noble and Amazon Book Two: The Ape and Book Three: The Curse for $3.99 each All THREE eBooks are available for download! Dracula of the Apes Coming Soon!